A Health Savings Account (HSA) is a portable savings account that allows you to set aside money for health care tax-free. You must have a high deductible health insurance plan to be able to take advantage of HSAs. The minimum deductible to qualify in 2019 is $1,350 for individuals and $2,700 for families, subject to cost-of-living adjustments. High deductible health plans usually cost less than traditional health care insurance, so the money that you save on insurance can therefore be put into your Health Savings Account. Money in an HSA rolls over from year to year (there is no “use it or lose it”). Your HSA is owned by you, not your employer, and you control the money in your HSA. You decide how to spend the money and what types of investments to make with the money in the account in order to make it grow. Many people compare an HSA to a “medical IRA”. 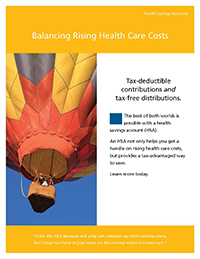 Contributions to HSAs by individuals are tax deductible, even if the taxpayer does not itemize. Contributions by an employer are not included in the individual’s taxable income. Individuals, their employers, or both can contribute tax-deductible funds each year up to the amount of the policy’s annual deductible, with a cap of $3,500 for individuals and $7,000 for families in 2019 and later (subject to cost-of-living adjustments). In addition, individuals over age 55 can make extra contributions to their accounts of up to $1,000 and still enjoy the same tax advantages. HSA funds can be used to cover the health insurance deductible and any co-payments for medical services, prescriptions, or products. In addition, HSA funds can be used to purchase over-the-counter drugs and long-term care insurance, and to pay health insurance premiums during any period of unemployment. The interest and investment earnings generated by the account are not taxable while in the HSA. Amounts distributed are not taxable as long as they are used to pay for qualified medical expenses. Download our HSA Application and return it in person, by mail, or by fax to 561.982.7798. Or call your Credit Union representative at 800.873.5100 or email us at serviceplus@ibmsecu.org to open your HSA or for more information. Need help transferring your HSA from another financial institution? Contact us for assistance.